Mrs. Persia Tobin-Evelyn, who graduated from the Eugene Dupuch Law School at the top of her class (Valedictorian) this year, was presented with the McW Todman Award for Best BVI Law Student on Tuesday 1 December. According to Mrs.Evelyn her decision to enter the legal field was gradual. In fact, she stated that it took her three years to make a firm decision to pursue a career in law. Her decision was influenced by her desire for a career change, and her admiration for the late Dr. J. S. Archibald, and her own father who was in law enforcement. Having made the decision, she did her undergraduate studies at the University of the West Indies Cave Hill campus before moving to law school in The Bahamas. The Attorney described law school as challenging, but she said she was determined to do her best. “The two years were quite challenging, and quite a lot of hard work. It was intense trying to manage demands of school — it took focus and determination to get through,” she disclosed. 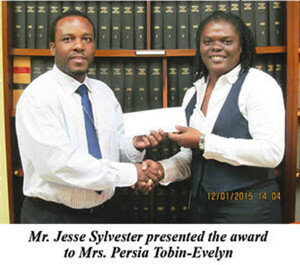 Jesse Sylvester, Accountant of McW Todman presented the Award to Mrs. Evelyn on behalf of the lawfirm, and explained that the lawfirm has an established relationship with the law school and was informed of Mrs. Evelyn’s academic achievement earlier this year. He said that the company was pleased to make the presentation and wished Mrs. Evelyn the best in her future as a lawyer. Attorney Evelyn is currently employed in the Private Client Department of Harneys, and was called to the Bar on Wednesday 2 December.